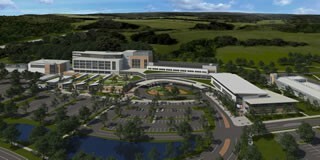 On April 9, 2013, UW Health broke ground on a new hospital, outpatient care and wellness facility in Madison, Wisconsin. Located on Madison’s east side in The American Center business park, UW Health at The American Center will be a unique health care campus featuring inpatient and outpatient services along with wellness and preventive care programs. Expected to open in August of 2015, the three story, 496,000 square foot structure will offer a 56 bed inpatient hospital, two floors of clinical exam rooms, a physical therapy department, and a 24-hour emergency department.